“What is art therapy?” – A question art therapists find themselves answering frequently. Creative Arts Therapies Week is a chance each year to reflect on what it means to be an art therapist and an opportunity to educate others on the profession. Read three stories about how these art therapists answer the question as they also reflect on their identities as art therapists and the reward of helping others reach their potential. Join the conversation online using #CATW2018 and #WeAreArtTherapists! 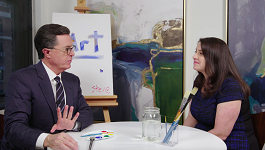 Yesterday, March 14, The Late Show with Stephen Colbert featured a segment on art therapy with AATA member, Rachel Brandoff, PhD, ATR-BC, LCAT. He spoke with Dr. Brandoff about the profession and even made some art himself. The show is generously auctioning off three pieces of Colbert's art and donating the proceeds to the AATA! Please check out the auction page and watch the segment if you missed it! The Research Committee is proud to announce two unprecedented opportunities this year: seed grants intended to support pilot studies and clinician-researcher partnerships in art therapy. The Research Committee is also accepting applications for 2018 Research Awards. The AATA and its generous donors provide these annual awards which are publicly presented at a special ceremony during the AATA’s Annual Conference. Transform your passion into an advanced career in art therapy with Mount Mary University’s low residency/hybrid doctoral program for working professionals. Miki Goerdt, LCSW, ATR-P grew up in Japan and moved to the U.S. 20 years ago. She specializes in working with older adults with mental illness and individuals with chronic medical illness/disabilities. After working in Arlington County’s mental health teams for nine years, she recently transitioned to a group practice setting. Goerdt has worked at a dialysis center, in hospice, a nursing home, an assisted living facility, and an inpatient psychiatric unit. 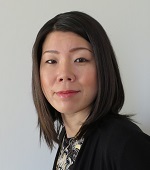 This year, she was excited to start volunteering with the AATA and hopes to focus her effort on increasing the number of art therapists with various ethnic, racial and cultural backgrounds. The AATA's Art Therapy Today includes a digest of the most important news selected for the AATA from thousands of sources. Guest articles may be submitted to Clara Keane at ckeane@arttherapy.org. Publication of any guest article is at the sole discretion of the AATA. The opinions expressed and/or contents of guest articles, advertisements, and external links included in any AATA publication do not represent the positions or policies of the AATA. The AATA makes no warranty or representation concerning the accuracy of such content. We provide medical technologies and services that are shaping a new age of patient care.